Since I have recently rediscovered my enjoyment of origami, I found this video quite entertaining. It is eight minutes and twenty three seconds long, and appeared in my recommended videos, which I’m quite thankful for. It’s a pleasant video to watch, ignoring their eyebrows which I find quite off-putting since they are very… present? If you watch it you should be able to see what I mean (I also apologise in case that is now all that you notice when you watch it). Anyway, this video lead to the discovery of the channel “The CGBros” which has quite a few other videos on CG and VFX that I fully intend on exploring. 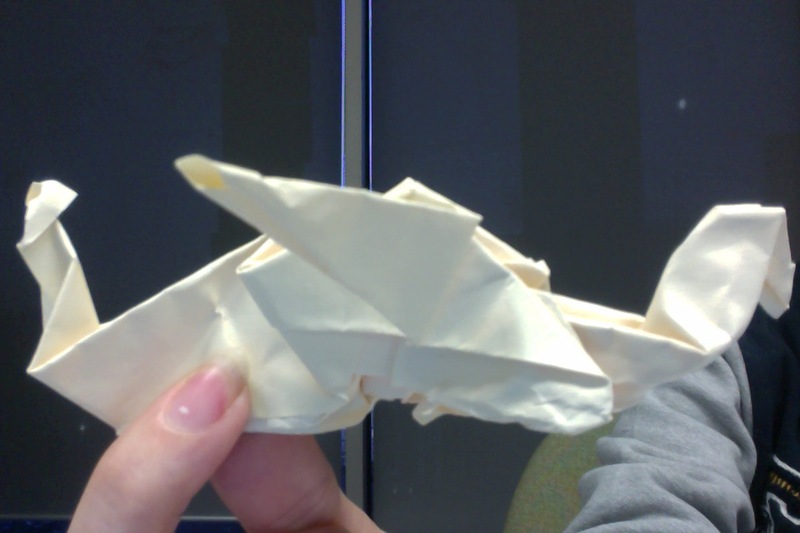 I was playing about with some paper and decided to do something productive instead, so I made a dragon. It was supposed to have legs as well but I ripped it a bit so that was no longer possible. Not bad for a first attempt thought, eh?